Delaware Hayes’ Nate Griggs (35) puts up a layin during the first half of Saturday’s Division I District Tournament game against host Westerville Central. 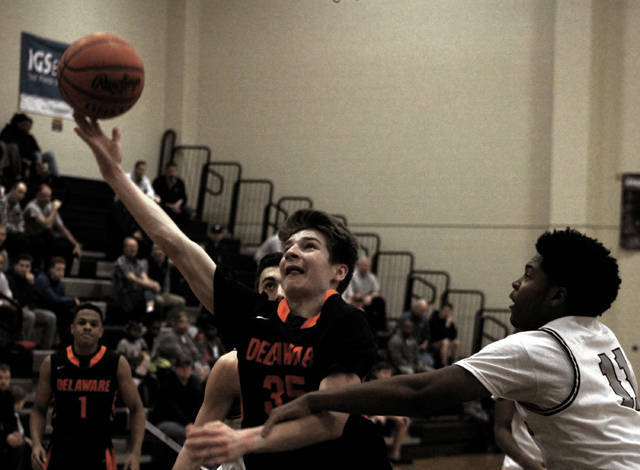 The Delaware Hayes boys basketball team gave host Westerville Central all it could handle in the first round of the Division I District Tournament Saturday afternoon in Westerville. But, Thomas Hickman scored 19 of his game-high 21 points in the second half, helping 11th-seeded Central hold off 32nd-seeded Delaware’s upset bid in a 47-39 win. The game sounded like the quality control room in a whistle factory. Neither team could really get in an offense groove in a second half where both squads were whistled for a combined 40 fouls leading to 38 free throw attempts. Both teams were in the bonus by the end of the third quarter. “I thought there were times in the second half that we could have done a better job of contesting shots without fouling,” Blackburn said. The Warhawks (16-7) took the lead for good on a Solomon Wells free throw with 5:59 left after the teams stayed within five points of each other for all but the final 20 seconds. Hickman needed 14 points coming in to give him 1,000 for his career. His milestone basket gave the Warhawks a 37-34 lead with 4:51 remaining. Central scored its next eight points at the foul line to put the game away before a Hickman steal and dunk in the final seconds accounted for the final margin. Still, Delaware had its chances. Paul Burris had a key steal with 2:17 left and the Pacers trailing 38-36, but his go-ahead three-point attempt was off the mark. Terin Kinsway missed a layup in traffic that could have cut the deficit to two in the final 20 seconds with the Pacers trailing 43-39. The Pacers held Central to just four points in the second quarter and led 20-17 at the break, overcoming a five-point deficit to take the lead on a Tracey Sumner layup off a Burris feed with 1:35 left before halftime. Delaware led by as many as five early in the third quarter after a pair of Paul Frentsos free throws made it 22-17. The teams stayed within a possession of each other for much of the contest, fighting through nine ties and six lead changes throughout. The game turned against the Pacers, who led 27-24 when Kinsway was charged with his fourth foul late in the third. Hickman converted one of the two ensuing free throw attempts before tying the game with a basket on Central’s next possession and giving his team the lead with a pair of free throws. Nate Griggs, who led the Pacers with 16 points, converted a three-point play to give them a 32-29 lead with 0:32 left in the third. “I thought our guys really weathered the storm so we could keep him out and have him late in the game,” Blackburn said. Hickman tied the game with a three early in the fourth. Griggs followed with a pair of free throws before Wells tied it again with a basket, setting up his go-ahead free throw on the next Warhawk possession. Josh McDaniel had 10 points for the Warhawks. Central hosts 24th-seeded Whitehall-Yearling in the second round Friday night at 7 p.m.